I'm sitting in a room, surrounded by boxes that hold the focus of my life for the 2015-16 school year. Really, the focus will be the students who are using what's inside the boxes, but you get the idea. 400 Chromebooks, 200 laptops, coupled with lots of planning, fun, stressing, planning, spreadsheeting, budgeting, convincing, planning, coaching, learning and evaluating. And planning. I'm ready to get cookin'. 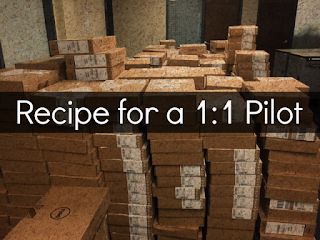 So what's the recipe for a successful 1:1 pilot? To be honest, I don't know: we're only at the beginning. But let me tell you the blend of ingredients we're using to try and get there. Take 20 courageous (a word I don't use lightly) teachers. Tell them they're going to be pioneers, blazing a path where no teachers in our district have traveled before. Let them know that we are all learning with them and that they have the privilege and responsibility of shaping where our district's digital learning goes in the future. Then be grateful when they don't run away. Toss in 1100 students from 4th-6th grade. Trust in them and believe that they can handle the responsibilities that come with technology: walking the narrow path of digital citizenship, becoming creators with an active stake in their own learning, and communicating and collaborating productively with others. Also, hope that they won't learn about MIL-STD-810 testing and attempt it on their own with the devices. Stir in "specialists" who don't feel incredibly special: just teachers at heart who think technology is a good thing for students when it's used the right way. Stick us in classrooms to coach and prod, question and comfort, encourage, laugh, model, assist, and generally do whatever we can to release the unbelievable amount of potential in the previous two ingredients. Sprinkle in tools and terminology that are a part of digital learning, like some delightfully airy Dell 11 Chromebooks and robust 3340 laptops, all bursting with Google Apps and every web-based tool you can think of. I guess the standard edtech buzzwords will be part of the blend too, and that's okay. The goal there is to avoid "language with more syllables than meaning" and to not dilute the flavor with vacuous vocabulary and endless acronyms. Finally, distribute everything over a supportive base of administrators, principals and board members; insert it into the pressure cooker of the importance of the moment; and pray to the Lord on high that after you've done all you can do, it comes out looking like the vision you had for it in the beginning.